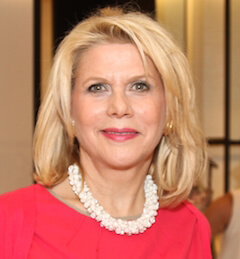 Francine LeFrak is a social entrepreneur whose work has stirred the conscience of modern society. She is a multiple Tony, Emmy and Peabody award-winning producer of social issue films. In 2008, Francine founded the ‘trade not aid’ jewelry initiative SAME SKY that provides training and employment to survivors of the Rwandan genocide who are now living with HIV/AIDS. Same Sky now also provides employment to women, who have recently been released from Hudson County Jail. In recognition of Francine’s commitment to empowering women, she has been honored with a number of awards including the Woman Who Cares Award, the Ellis Island Medal of Honor, the Women Together Award presented at the UN for microfinance, and the “Chevalier” of the Legion of Honor as presented by the French government. Francine is the Chair Emerita of the Women’s Leadership Board at the Harvard Kennedy School. She also serves as CEO of the Samuel J. and Ethel LeFrak Foundation and is a founder of The Francine A. LeFrak Foundation.